MOSCOW --- At present, the infantry fighting vehicle (IFV) is one of the most popular type of military hardware on the global arms market. Mechanized infantry that rides IFVs or armoured personnel carriers (APC) is the strike force of many armed forces of the world’s states. 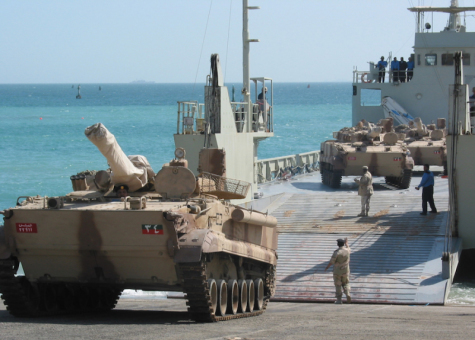 Therefore, the market of IFVs is developing at a quickened pace. Russia’s Rosoboronexport company (a subsidiary of the Rostec state corporation) offers several types of reliable IFVs that meet the strictest requirements to this type of hardware. The company promotes the BMP-3 IFV. The BMP-3 infantry fighting vehicle is designed to increase the mobility, level of armament, and protection of troops on the battlefield. BMP-3 is a unique combat vehicle that combines the capabilities of an infantry fighting vehicle, a tank destroyer, an amphibious carrier, and a fire support vehicle. The application of innovative design features allowed developing of a combat platform that harmonically incorporates unmatched firepower, high maneuverability, and protection. The vehicle is fitted with a unique armament suite that includes a 100mm gun-launcher, a 30mm automatic cannon, and a 7.62mm machinegun in a single unit, as well as two bow-mounted machineguns in the front part of the vehicle’s hull. The 100mm semi-automatic rifled gun can fire both high-explosive rounds and a guided missile at distances of up to 4,000 m. The loading mechanism ensures a firing rate of 10 rounds per minute. The 30mm dual-feed automatic cannon is used against ground and aerial targets at distances of up to 4,000 m. It can fire three types of rounds, namely, high-explosive incendiary, armour-piercing tracer, and high-explosive tracer ones. The sighting unit with integrated rangefinder and missile guidance system features advanced optical characteristics. An independent dual-axis field of view stabilization ensures high firing accuracy. The night sighting system with a thermal imaging camera allows effective observing and firing not only by night, but also in fog, dust or smoke conditions. A multifuel engine and a hydromechanical transmission of innovative design provide high maneuvering capabilities. The vehicle features two water jets intended for swimming. It can cross water obstacles without preparation. BMP-3 is fitted with modern communication systems, a nuclear/biological/chemical (NBC) protection, fire extinguishing equipment, a smoke screening system, and self-digging devices. According to the specifications of the BMP-3 infantry fighting vehicle in the official catalogue of the Rosoboronexport company, it has a combat weight of 18.7 t, a crew of three servicemen, a passenger capacity of seven soldiers (plus two additional seats), a maximum road speed of 70 km/h, a maximum swimming speed of 10 km/h, an average dry unsurfaced road speed of 45 km/h, and a road range of 600 km. The vehicle is powered by a multifuel engine (450 h.p.) with a liquid cooling system. The armament suite of BMP-3 incorporates a 100 mm 2A70 semi-automatic rifled gun-launcher (an ammunition load of 22+18 high-explosive rounds (22 in the loading mechanism and 18 in non-mechanized stowage) and of eight anti-tank guided missiles (including three in the loading mechanism)), a 30 mm 2A72 automatic cannon (an ammunition load of 500 rounds), and three PKTM machineguns (an ammunition load of 2,000 rounds per each machinegun). Rosoboronexport also promotes the BMP-3F IFV. The BMP-3F infantry fighting vehicle is a modification of the BMP-3 IFV. It has retained all the unique features of the basic model: BMP-3F can be used as an infantry fighting vehicle, a tank destroyer, an amphibious carrier, and a fire support vehicle. BMP-3F is intended for naval infantry units that operate in seashore environment. The vehicle has retained the armament suite of the basic model that incorporates a 100mm gun-launcher, a 30mm automatic cannon, and a 7.62mm machinegun in a single unit, as well as two bow-mounted machineguns in the front part of the vehicle’s hull. The fire control system is also the same: it includes the sighting unit with integrated rangefinder and missile guidance system and the night sighting system with a thermal imaging camera. The IFV features several advantages that increase its floatability and ensure effective firing when afloat. The vision blocks in the turret are fitted with additional caps that protect against spindrifts. The wave deflector has been replaced with an advanced lightened one that does not allow washing down of the driver`s vision block. The vehicle is complemented by a lengthened telescopic air intake. The self-digging equipment has been removed. BMP-3F ensures accomplishing of firing and transporting tasks in both ground and maritime environments. The vehicle can leave landing ship and return to it in sea without shore approach. BMP-3F can swim at Level 3 sea state and conduct firing against ground and surface targets at Level 2 sea state. According to the specifications of the BMP-3F infantry fighting vehicle in the official catalogue of the Rosoboronexport company, it has a combat weight of 18.7 t, a crew of three servicemen, a passenger capacity of seven soldiers (plus two additional seats), a maximum road speed of 70 km/h, a maximum swimming speed of 10 km/h, an average dry unsurfaced road speed of 45 km/h, and a road range of 600 km. The vehicle is powered by a multifuel engine (450 h.p.) with a liquid cooling system. The armament suite of BMP-3F incorporates a 100 mm 2A70 semi-automatic rifled gun-launcher (an ammunition load of 22 high-explosive rounds in the loading mechanism and of eight anti-tank guided missiles), a 30 mm 2A72 automatic cannon (an ammunition load of 500 rounds), and three PKTM machineguns (an ammunition load of 2,000 rounds per each machinegun). Rosoboronexport also offers the upgrades of the BMP-2 IFVs. The upgraded vehicle is designated BMP-2M. The BMP-2M IFV is designed to support motorized rifle units and to increase mobility, level of armament, and protection of personnel in action. Two variants of BMP-2M have been developed during the modernization process. The first variant designated sb4-2 is designed to engage enemy`s manpower, while the second one (sb4-3) - to engage armoured vehicles. The BMP-2M sb4-2’s armament suite has been reinforced by an additional 30 mm AG-17 automatic grenade launcher installed on an inverted L-shape mount in the rear part of the turret. It is guided through the medium of the gunner’s main sighting system or the commander`s 1PZ-13 sight that has the relevant grid intended for firing from the automatic grenade launcher at distances of up to 1,730 m.
To fire the main armament, the vehicle has received the BPK-3-42 combined binocular-type gunner`s sighting system that allows the recognition of a tank’s side projection at a distance of no less than 1,300 m by night in active mode. The PL-1 laser illuminator is used to lase targets as a source of infrared illumination. The BMP-2M IFV in the sb4-2 configuration is armed with the 2nd-generation anti-tank system to engage enemy`s tanks and other heavy-protected vehicles. The BMP-2M sb4-3 features an up-to-date multichannel gunner’s sight, a new weapon stabilizer, and a ballistic calculator with firing condition sensors. The multichannel gunner’s sight with an independent field of view stabilization incorporates a variable power optical channel, a night thermal imager, a laser rangefinder, and a missile guidance channel. It facilitates the target reconnaissance process, reduces time and increases effectiveness of firing missions accomplishing. The sight has a tank-type target detection range of up to 5,000 m and a target recognition distance of up to 3,000 m by night (using the thermal imager). A stabilized platform with two ready-to-launch anti-tank laser beam-guided missiles with high-explosive anti-tank or thermobaric warheads is installed on the vehicle’s turret roof. The gunner guides the missiles using the main sight; he can fire them on the move and at-halt. The high speed of the missile reduces the targeting time, while high armour-piercing capability provides the elimination of almost all modern tanks. The upgraded IFVs are powered by the enhanced power turbocharged engine. The vehicles also feature a chassis with advanced operating characteristics (road wheels of increased lift capacity, reinforced torsion bars, shock absorbers of increased energy absorption capacity, and tracks with rubber track shoes). The aforementioned items allow increasing of the vehicle`s maneuverability, running smoothness, and average speed. According to the specifications of the BMP-2M sb4-2 infantry fighting vehicle in the official catalogue of the Rosoboronexport company, it has a combat weight of 16 (+ 2%) t, a crew of three servicemen, a passenger capacity of seven soldiers, a maximum road speed of 65 km/h, a maximum swimming speed of 7 km/h, an average dry unsurfaced road speed of 37.6 km/h, and a road range of 600 km. The vehicle is powered by the turbocharged 6-cylinder 4-stroke high-speed engine (360 h.p.) with direct fuel injection. BMP-2M sb4-2 is armed with a 30 mm 2A42 automatic cannon (an ammunition load of 500 rounds), a 7.62 mm PKT or PKTM coaxial machinegun (an ammunition load of 2,000 cartridges in belt), a 30 mm AG-17 automatic grenade launcher (an ammunition load of 250 grenades), and an anti-tank guided missile system (an ammunition load of 4 missiles). The IFV is an amphibious vehicle that can be transported by planes. According to the specifications of the BMP-2M sb4-3 infantry fighting vehicle in the official catalogue of the Rosoboronexport company, it has a combat weight of 16 (+ 2%) t, a crew of three servicemen, a passenger capacity of seven soldiers, a maximum road speed of 65 km/h, a maximum swimming speed of 7 km/h, an average dry unsurfaced road speed of 37.6 km/h, and a road range of 600 km. The vehicle is powered by the turbocharged 6-cylinder 4-stroke high-speed engine (360 h.p.) with direct fuel injection. BMP-2M sb4-3 is armed with a 30 mm 2A42 automatic cannon (an ammunition load of 500 rounds), a 7.62 mm PKT or PKTM coaxial machinegun (an ammunition load of 2,000 cartridges in belt), and an anti-tank guided missile system (an ammunition load of 4 missiles). The IFV is an amphibious vehicle that can be transported by planes.